When you learn how to frost a cake, a sweet creamy luscious frosting will be able to transform a plain simple cake into an eloquent dessert suitable for entertaining. Depending on your cake recipe and what is the occasion for which you are making a cake, there are many different ways of covering your baked cake. It is common for some cake recipes baked in an oblong pan to have a topping added after baking to turn it into a delicious dessert. For example, these quick toppings could have a cream base with nuts or coconut added. Toppings are an easy way to finish a cake without having to prepare and frost the cake. Combine and blend all ingredients in medium bowl. Spread evenly over a hot cake still in pan (9 X 13 inch). Place under the oven broiler about 4 inches from heat for about 2 to 3 minutes or until top begins to bubble. Remove from heat and set to cool. Another quick an easy way to cover a single layer cake is by dusting with cocoa powder, powdered sugar or a cinnamon and sugar mixture. This technique goes very well on rich moist cakes; powdered sugar goes well with a rich moist chocolate cake and cinnamon and sugar is nice on a most apple bundt cake. For extra attraction the dusting can create a pattern by using a stencil. Melt butter in saucepan; dissolve brown sugar in the butter. Add the milk to the pan and bring to a boil; boil 2 minutes. Put powdered sugar in mixing bowl. Add hot mixture to powdered sugar in bowl; beat until creamy and spreadable. NOTE: As frosting cools it gets very firm. If needed you can beat in a little more milk to make it spreadable. If learning how to frost a cake, uncooked frostings are the easiest of the frostings to make. These can be very delicious by combining a shortening like butter, maybe cream cheese, powdered sugar, a liquid such as cream and some type of flavoring. For this type of frosting, the sugar needs to be sifted and the mixture needs to be beaten until smooth and creamy. The uncooked frostings should be easy to spread and moist. Cream butter with sugar adding cream while beating. Beat in the flavorings and beat until easy to spread. Learn how to make cooked frosting if learning how to frost a cake. These are more difficult to make but are well worth the effort. Many call the cooked frostings the royalty of frostings. These can be in any flavor like vanilla, chocolate or caramel. They can be thick and creamy of fluffy like the sea foam version. Cook sugar, water and syrup to a hard ball stage (When dropped in cup cold water, syrup forms hard ball). Remove from heat, add butter and cream and beat until almost cold. Stir in vanilla and spread over cake. Try using glazes on your cakes if learning how to frost a cake. A glaze is a quick and easy substitution for frosting. These are a thin covering and can be cooked or uncooked. I like to use a glaze sometimes on angel food cake, sponge cake, chiffon and even fruit cakes. I find a light glaze enhances the flavor when heavy frosting distracts from the flavor. After brushing the crumbs away from the cake, with a spoon drizzle the glaze over the cake. Combine sugar, butter, 1 ½ Tablespoons milk and vanilla in a small bowl. Beat by hand until mixture is smooth; add remaining milk if desired. Combine sugar, cocoa powder and cornstarch in saucepan. Add water and stir over medium heat until boiling and thickened. Make sure cakes and frostings are completely cool before spreading frosting. 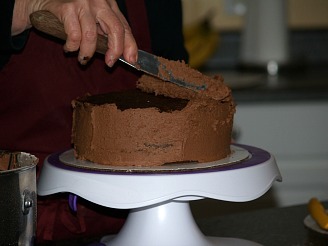 Before frosting trim off any extra brown or crisp edges with a kitchen shears and brush away any crumbs. To keep cake plate clean, arrange pieces of wax paper around bottom of cake until finished frosting. 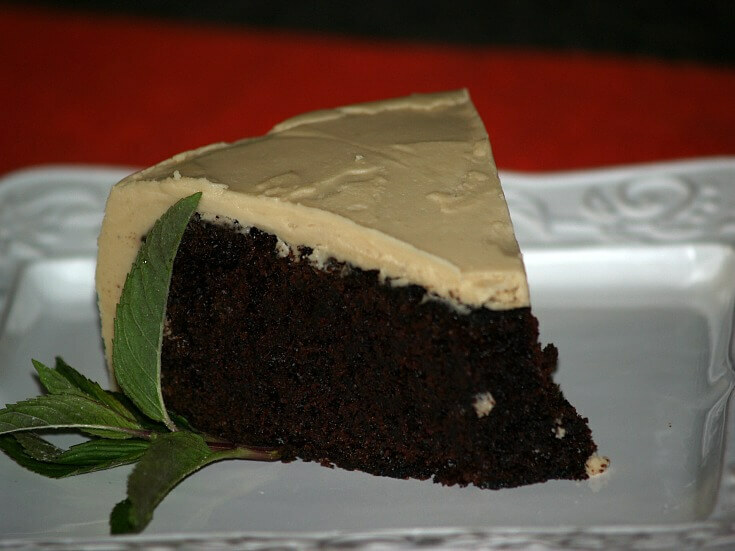 For frosting a layer cake, place one layer on plate and spread top with frosting; follow with a second layer. If there is a third layer, frost top of second layer then top with third. Frost side with a thin layer to set the crumbs then put a second generous layer over it. Finally add a layer of frosting on the top of the cake.